Standards can be great tools for the coffee industry as they are trusted reference instruments established by knowledgeable subject-matter experts. An SCA standard is a high-quality recommendation by the Standards Committee. It is a quantifiable and qualifiable measure, based upon scientific testing, which set values and/or ranges of values for coffee. Currently, the SCA has standards for water, green coffee, and cupping coffee. To be considered specialty grade, green coffee shall have zero category one (1) defects and five or less category two (2) defects. See the SCA green grading handbook for more information on these defects. A 350 gram sample of coffee is necessary to grade green coffee. When grading green coffee, the light level on the tabletop and grading mat shall be full spectrum and at least 4000 Kelvin (K) /1200 Lux (lx) /120 foot-candles (fc). Green grading shall be done on a table at least two (2) feet long and two (2) feet wide (0.6096 meters by 0.6096 meters), on a black grading mat of at least the same size. Specialty grade green coffee beans shall have a water activity measurement lower than 0.70aw. Standard: Specialty grade green coffee beans shall have a water activity measurement lower than 0.70aw. Aim: To control wholesomeness and sensory quality of coffee raw material by minimizing the possibility of microorganism infection. Background: Compared to moisture content, water activity (aw) is considered a better parameter for quantifying the degree of binding of all water present in food, both free and bound and, therefore, its availability to act as a solvent and participate in chemical, biochemical and microbiological transformations (Fellows, 2006), becoming the main indicator of food deterioration. As a roasting/quenching/packaging technological aid, water is part of the weight of the coffee in the finished product and therefore affects final wholesale and retail price. Water activity (aw) is a measurement of the availability of water for survival and growth of microorganisms on nutritious substrates, including green coffee. It differs from moisture content inasmuch as water can be bound in different ways to food substrate, making it unavailable for microorganisms' growth and production of metabolites, e.g. undesirable contaminants like flavor taints or toxins. Only the fraction of water that can go in equilibrium with vapor phase (i.e. evaporate) can be profited by microorganisms like bacteria, yeasts and – more importantly – molds for germination, survival and growth. Such fraction can be accurately inferred by measurement of aw. Mycotoxins are toxic secondary metabolites produced by fungi. Toxigenic fungi can grow both in the field during harvesting and storage, due to several factors inherent in the substrate and factors inherent in conditions involving the substrate (Scussel, 1998). The most common mycotoxin related to coffee is ochratoxin A: there are three major ochratoxin A-producing fungi that are associated with coffee: Aspergillus carbonarius, Aspergillus ochraceus and, rarely, Aspergillus niger (Silva et al., 2008). The fungus Aspergillus ochraceus is the leading producer of ochratoxin A in coffee. It develops in environments with temperatures between 8°C and 37°C, with the optimum temperature between 24 and 31°C. The minimum water activity for its development is 0.76 at 25°C, with the optimum aw ranging from 0.95 to 0.99 and pH between 3 and 10 (Hocking and Pitt, 1997). Although Aspergillus ochraceus develops from a water activity of 0.76, the toxin is produced in coffee beans from 0.85, and 0.97 is the optimal aw (Moss, 1996). Implementation: Water activity is defined as the ratio of the vapor pressure of water in a given material to the vapor pressure of pure water at the same temperature. When vapor and temperature equilibrium are obtained in a sealed measurement chamber, the water activity of the sample is equal to the relative humidity of air surrounding it. Relative humidity measurement is a straightforward albeit delicate analysis, best performed in dedicated apparatus commercially available. Guidelines: Follow the calibration and operations instructions given by the water activity testing equipment manufacture, placing the appropriate quantity of coffee beans into the device. Caveat 1: Any analytical determination is at most as good as the sampling step that precedes it. Caveat 2: aw determinations cannot assure that previous infection and spoilage did not occur on the green coffee in the past. Monitoring plans for extant presence of mycotoxins should always be in place throughout the farm-to-roaster supply chain. When cupping, the ratio of 8.25 grams (whole bean) coffee (± 0.25 grams), to 5.07 fluid ounces (150 ml) water shall be used. When adjusting due to vessel size, a ratio of 1.63 grams (whole bean) coffee per 1 fluid ounce of water (or 0.055 g coffee per 1 ml water) shall be used. Cupping vessels shall be of tempered glass or ceramic material. They shall be between 7 and 9 fluid ounces (207 ml to 266 ml), with a top diameter of between 3 and 3.5 inches (76 - 89 mm). All cups used shall be of identical volume, dimensions and material of manufacture, and have lids. Cupping water temperature shall be 200°F ± 2°F (92.2 – 94.4°C) when poured on grounds. 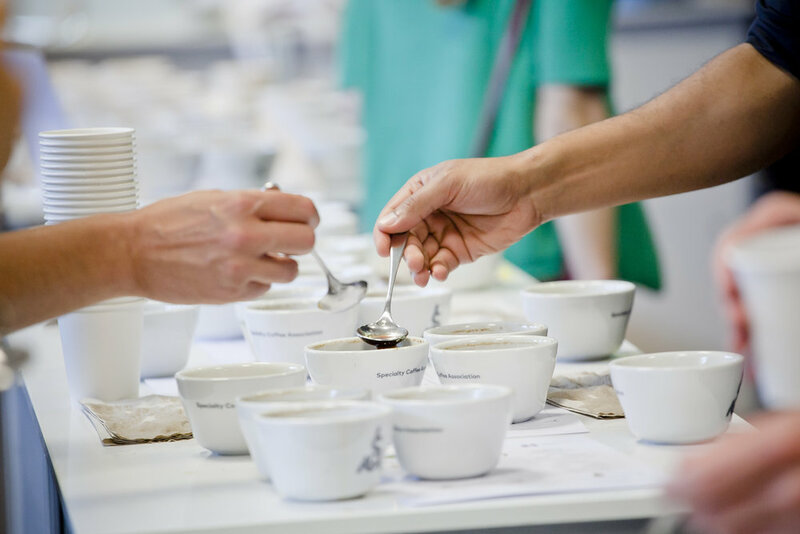 Cupping Water shall meet all the requirements listed in the SCA Standard 'Water for Brewing Specialty Coffee', which can be found on the SCA Resources web page. The coffee used for cupping shall be ground so that 70-75 percent of the grinds pass through the 20 mesh sieve. The roasting of coffee for cupping shall take between 8 and 12 minutes, and shall be used for cupping between 8 and 24 hours after roasting. Cupping room minimum dimensions (for exactly one cupping table) shall be no smaller than 110 square feet (10.22 m2). The cupping room shall be sufficient size to accommodate all students for cupping at the same time. Each cupping table shall have 36-inch space surrounding the table for cuppers. No other furniture or fixtures shall be closer than 36-inches from the cupping table. If two or more tables are in the cupping room, a 60-inch radius shall be required between tables. Cupping spoons shall hold 0.135 – 0.169 fluid ounces (4-5 ml) of coffee sample and should be of non-reactive metal. Odor is based on sensory olfactory determination. Color is based on sensory visual determination. TDS measured based on 4-4-2 conversion. The Target is the most desirable point in the Acceptable Range, although falling within the range is considered meeting the standard. These variances are in place to take into consideration real world circumstances, and the target gives the optimum measurement of each characteristic to strive for. For details of testing equipment & protocols, please see the SCA Water Quality Handbook. Coffee shall exhibit a brew strength, measured in Total Dissolved Solids, of 11.5 to 13.5 grams per liter, corresponding to 1.15 to 1.35 "percent" on the SCA Brewing Control Chart, resulting from a solubles extraction yield of 18 to 22 percent*.